Remember a couple months back when I posted that Amazon might have to shut down the Indian Kindle Store (due to a recently passed local law in India about foreign ownership of retailers)? I'm still waiting for confirmation from Amazon, but it looks like Amazon's plans for further Indian expansion have gone up in smoke. 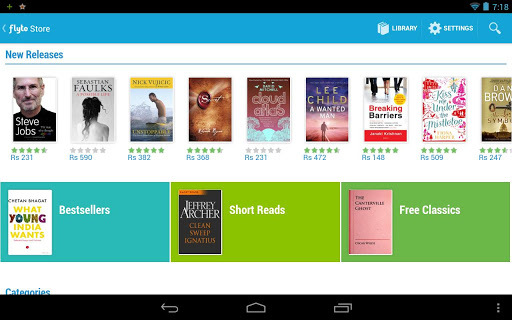 But I suppose that's good news for the competition like Flipkart, which just launched their ebookstore. This media and gadget retailer opened the Flyte mp3 store earlier this year, and as of today they are selling ebooks. Flipkart is reportedly stocking over 100,000 titles in Flyte, including local titles as well as around 4000 free ebooks. Reading the ebooks requires the Flyte eBook app for Android, and that looks like it could be a problem for readers given that it's not clear whether Flyte is using a standard form of DRM. Flipkart has not yet released a similar app for iOS, but they do have plans to release an app for WIndows 8. Flipkart is probably going to have some trouble trying to capture that tech-savvy reader base. These are folks who will likely either know or be able to learn enough about ebooks to value being able to read them on more than just their Android tablet and/or smartphone. Update: It took Amazon 2 weeks to respond, but I finally know why the Indian Kindle Store was in accessible. Amazon changed the behavior of the link. Now you can only see that Kindle Store if you are logged out or if your country is set to India. Given that the Indian Kindle Store was little more than a collection of pages on Amazon.com, the absence of the 5 month old store is rather difficult to explain. The only explanation I can come up with is that Amazon removed the pages in response to a recently passed Indian law. That law blocked foreign owned retailers from selling good on a website. This could also explain why Amazon is no longer locally selling the Kindle on Junglee, their Indian subsidiary, but are instead shipping the ereader from outside India. Junglee itself is not a retail site but a marketplace website where other retailers sell products, so apprently it has not been affected by the new law. Hi , first of all I would say that your site is well designed and very organised . I am Anand from India , wish to buy a kindle paper white for my younger sister. I just want to ask that, is it right time to buy this gadget . Means for India do Amazon offer a wide array of books..